This particular soldier is the one who kills Lokir during his futile attempt to avoid the headsman's axe during Unbound. Imperial Soldiers are the forces of the Imperial Legion. They are mostly made up of Imperials; however local recruiting has increased the amount of Nords in the Legion. 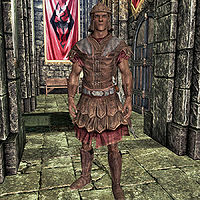 Highly trained and well led, the soldiers of the Imperial Legion have earned a reputation as some of the greatest warriors in Tamriel. Imperial Soldiers have fought in many memorable and historic battles, and used their training and skills to conquer the rest of Tamriel under Tiber Septim and establish the modern empire. There are no random female Imperial Soldiers. Imperial soldiers wear a full set of Imperial armor, and may carry an Imperial Sword or Bow. They may also randomly carry any Amulet of the Divines except Talos. You may come across a Stormcloak prisoner transport, where you may choose to free the prisoner. Choosing to free them will immediately cause the Legionnaires to become hostile. This page was last modified on 7 April 2019, at 18:09.